Academic regalia hoods. Doctoral & PhD hoods to wear with cap gown. 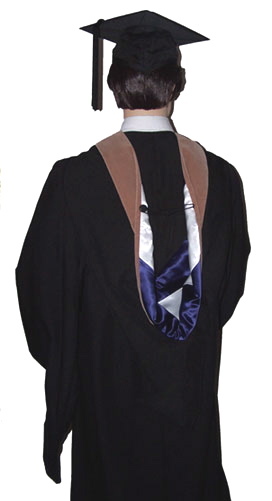 Left: PhD hood on deluxe doctoral gown (with black velvet). 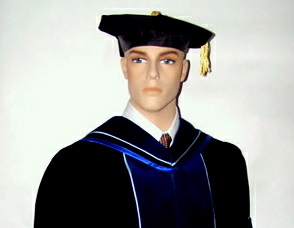 Right: PhD hood on deluxe PhD gown (with PhD blue velvet). Following a custom established in the 14th century, modern-day scholars display their academic achievements by wearing academic graduation hoods commencements and other important academic ceremonies. All of our university regalia strictly complies with the guidelines set forth by the Committee on Academic Customs and Ceremonies, appointed in 1959 by the American Council on Education. The velvet of the hood represents your degree. Customized deluxe J.D. doctoral hood with doctoral gown. Purple velvet on both gown and hood. Bright gold piping added to both gown and hood. 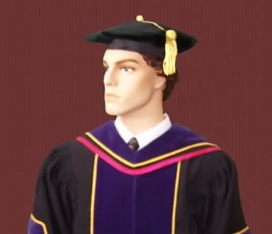 Deluxe MBA Master's hood with Faculty Master's gown. Navy & White lining. No additional piping added. As each hood is custom-made according to your school colors, degree colors, and type of degree (BA, MA, or PhD), we ask that you give us about +/- 8 weeks to process your order, especially during the graduation season. What if you don't have that much time to wait? What kind of hood do you need? You should purchase your hood to match the gown you have selected. Academic Graduation Hoods are available with or without piping. Deluxe Ed.D. doctoral hood with doctoral gown. Light blue piping added to both gown and hood. 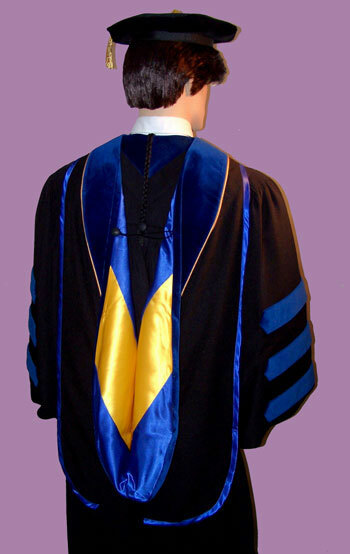 Deluxe doctoral gown and Ed.D. doctoral hood. Gold piping added to both gown and hood. Alternatevely, piping may be added to PhD hoods for PhD holders wishing to indicate their field of discipline. For example we could add gold piping to hood of a PhD of Science, or Light Blue piping for a PhD of Education to indicate their particular field of study since otherwise one would only be able to recognize that the person has a PhD (from their velvet), but not know what the PhD is in. 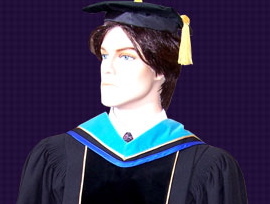 Deluxe Customized PhD gown and PhD hood. to represent PhD in Education. Deluxe PhD hood shown above, with gold piping added.